You spend a lot of time optimizing your website to streamline the shopper’s path through the retail funnel—making sure they see value at each point along the way. Once you navigate the shopper to the right product, it’s important that you take the necessary steps to seal the deal, and get the shopper across the finish line. 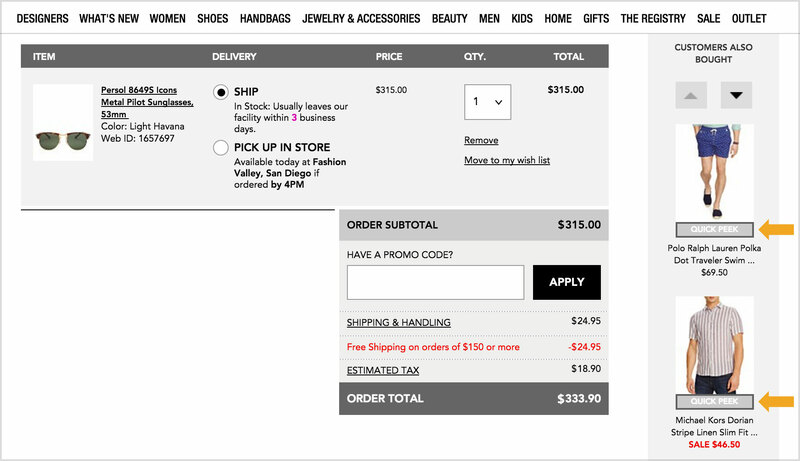 The cart page is a pivotal area for securing that conversion. When done well, you’ll get the sale, and then potentially entice the shopper to buy more items. When done poorly, you’ll disrupt conversion by distracting the shopper from the transaction you’ve fought so hard to get. And so we ask: How smart is your cart? Securing conversion is our primary objective on the cart page. If we can get the shopper to buy more stuff and grow the order value, that’s phenomenal! But, it shouldn’t compromise completing the sale. The location of recommendations must reflect this prioritization and not interfere with the shopper consuming information critical to the buying decision. As such, recommendations must be on the periphery of core content such as the cart summary, checkout call-to-action, promotional code inputs, and other key messaging and functionality. This usually means slotting a vertical placement in the right margin or a horizontal placement underneath the main content area. Otherwise, if more prominently placed, you’re baiting customers to continue shopping, which can be extremely disruptive to conversion. On the cart page, it’s imperative to use cross-sell recommendations that display products most often purchased with the seed item. However, since these kinds of recommendations rely on purchase behavior at the individual product level, something that happens much less frequently than browse activity, , it can be challenging for behavioral recommendations systems to always deliver intuitive cross-sell recommendations across a retailer’s entire catalog. I. Incorporate point-of-sale (POS) data in recommendations. If you have a brick-and-mortar presence, you probably have more offline POS transactions than online sales. Incorporating those in your online recommendations will provide a wealth of data from which to identify logical product associations. II. Employ rule-based recommendations. Create a set of advanced merchandising rules that governs what is recommended in cross-sell situations. For each category of products, define what categories you want represented in each recommendation slot—and then let the engine source products based on whatever brand, attribute or compatibility-matching requirements you might have configured. Ok, so now you have well-placement recommendations and you’ve optimized your cross-sell assortment across your entire catalog. What’s left? 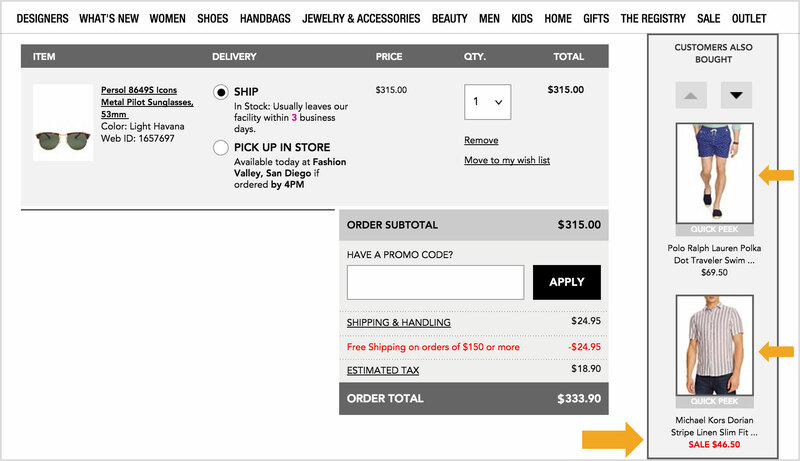 Once you’ve gotten the shopper to the cart page, create inertia that pushes them through the checkout process rather than casting them out to higher parts of the funnel. You can do this by presenting a recommendation layout that facilitates exploring a product and adding it to cart without leaving the current page. Implement ‘quick view’ functionality on recommendations that allows a shopper to access product information, configuration options (e.g., size/color), and add-to-cart capabilities with a single click. Without this functionality, you’re forcing shoppers to leave the cart page to explore recommended products, and they may never come back. Your cart page is sacred as it’s the gateway to more cash in your coffers. It’s imperative that the page experience drive shoppers to transact rather than pull them into a dangerous loop of product reconsideration. These are merely a small sample of tactics RichRelevance has deployed and validated using rigorous A/B and multivariate testing. We strongly encourage you to consider these optimizations for your retail site. They’ll make your cart smarter, protect your conversions, and grow your order values.